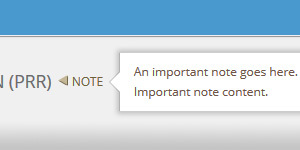 Popovers are useful for tooltips, notes, or other short messages. Bootstrap does a good job of its native popover tooltip, but needs a bit of help to work with a mobile device (since they don’t have hover). Be sure to remember to put the name of your element selector in place of the example. Solid Tip: The focus and blur methods are available in addition to click and hover should you have a need. You can of course assign the popovers to any kind of element you want, not just a span. Now your popovers will be mobile device friendly and will show up with a tap.